Federal Telephone & Radio (FTR) power transformer. Sealed. Shielded core. Part of Loren Timer Set AN/FFN-30. Brand new in the box!! 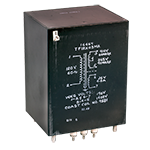 Transformer 120/240V AC to 5V @ 3 Amp, 6.3V @ 5 Amps, and 900V @ 200 Milliamps. 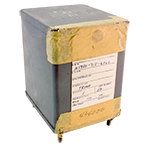 Transformer NSN: 5950-00-856-4476. Two 120 volt A/C (black, black/red and black/yellow, black/green) primary inputs to three secondary outputs 900 volt center tapped (red, red/yellow [c.t. ], red), 6.3 volt center tapped @ 5 amps (green, green/yellow [c.t. ], green), and 5 volt @ 3 amps (yellow, yellow). Electro Engineering power transformer. New in wood crate. 94 lbs gross weight. 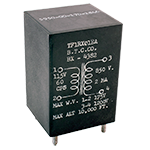 Freed hypersil transformer 260v, 90 milliamp output, also has 6.3v, 4 amp filament output. Open frame transformer rated 400 madc FW Bridge, Choke input. Collins transformer. Secondary marked "For Non-Continuous Duty Only". Hermetically sealed. Corner posts. Thordarson transformer. Sealed. Top terminals. New!! Thordarson plate / filament transformer. New!! Sealed, rounded corners. Made in the 1950's. Central Transformer Co. transformer. Hermetically sealed. Four 1/4" corner studs and terminals on bottom. 117V AC 60Hz primary and miltiple secondaries. Four 6.3V outputs at 1.5 amp, 3 amp, and 6 amp. One 225V AC output at 25 milliamps, and One 400V AC at 120 milliamps. 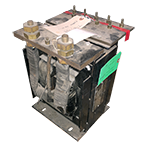 In the olden days, transformers commonly specified output voltage in DC assuming the user would be adding full bridge rectifiers. So the 400V DC @ 120mA would be the final output capability of this transformer. AC output at the coil of the transformer will be slightly more. Sealed transformer, terminals out bottom, corner posts. Multi-tapped secondary has common center tap with four outer windings: 440 vct @ 40 madc, 135 vct @ 200 madc, 80 vct @ 110 madc, 65 vct @ 500 madc + stand alone extra winding of 130 vct @ 30 madc. Hermetically sealed. Electrostatically shielded winding. 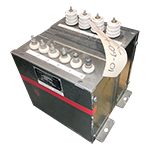 High voltage transformer rated @ 100 ma rms, 1680 wv insulation @ 10k feet. Berkshire Transformer power transformer. Hermetically sealed. Terminals & posts on bottom. NSN: 5950-809-9164. Freed transformer. Sealed. Mounts by bottom 10-32 tapped holes. Gold turret terminals on bottom. New!! Packed in 1960's foam rubber which reacted with finish. Must be repainted. ADC high voltage transformer. Hermetically sealed. Damaged: broken terminals, bent and broken stud posts. Dented corner. Kenyon Transformer Co. transformer. Used, clean. Alt. P/N: S-502365. General Electric high voltage transformer. Sealed case with designer "bow" sides. They don't make 'em like this anymore. Made in 1946. NSN: 5950-00-556-6718. Chicago transformer. Base mount, side terminals. 3500v test. Basler HV transformer made for Gates Radio. P/N: BE02727-001, BE-02727-001. Freed transformer made for "COLLINS RADIO COMPANY". Hermetically sealed. 3 holes in side flanges / mount at bottom. Truly Collin's quality, running at 212 ma this iron should double as a cooling plate for your soft drink. Plan on squeezing a little more out at full duty cycle! 2500v test. NSN: 5950-00-249-3201. UTC power transformer. 2,000v Hi-Pot. Used, removed. Only 2 available. 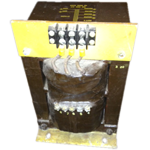 Freed high voltage transformer. Hermetically sealed. 3 holes in side flanges / mount at bottom. A real quality piece. It should handle rated power full duty cycle and intermittently 50% more. Tortran vacuum tube amplifier transformer. Center epoxy potted with 3/8" mount hole. Dual primaries 115v (230v in series) 50/60Hz 740va. Five secondaries 390v C.T. at 1.5 amps, 195v at 0.5 amps, 14.8v at 2 amps, 6.3v at 3.6 amps, 64v at 0.1 amps. 6.1"DIA x 3"H, 14 lbs. Baltimore Transformer Co. power transformer. 115v AC primary. 850v AC secondary @ 2mA, 1200vw secondary. 4 wire hook terminals. 1-1/4" x 1-3/8", 8-32 studs mounting centers. Hermetically sealed. 1.9"L x 1.8"W x 2.75"H.
Hewlett Packard vintage vacuum tube plate transformer. Primary: 120/240v. Secondary: 170/880/1140v. Hermetically sealed. 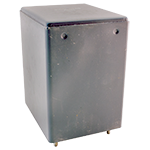 Dimensions: 4" x 4-5/8" x 5-1/4"
Hewlett Packard power transformer. Primary: 115/230v @ 50-1000 Hz. Secondaries: 250v @ 900mA & 205v @ 400mA. 4" x 4-5/8" x 5-1/4". 3" x 3-5/8" mounting centers on 1/4-20 studs. Turret terminals on bottom. Hermetically sealed. 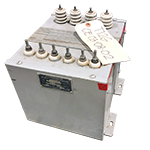 HP transformer for vacuum tube test equipment. Coast Coil high voltage transformer. 7 terminal. Working volts: 1, 2, 6, 7 = 190v, 3, 4, 5 = 1400v. Mil-type TF1RX03MA. Coast Coil No. 9581. Continental Electric plate transformer. Used spare for Continental 420. 15 kv test. 60 Hz. Continental Electronics plate transformer. 15,000v test. Used. Spare for Continental 420.